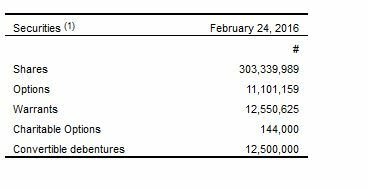 VANCOUVER, Feb. 27, 2017 /CNW/ – Aurora Cannabis Inc. (the “Company” or “Aurora”) (TSXV: ACB) (OTC: ACBFF) (Frankfurt: 21P; WKN: A1C4WM) today announced its financial and operational results for the quarter ended December 31, 2016 (Q2 2017). Revenues of $3.9 million, as compared to $0 (nil) for Q2 2016. Q2 2017 revenues reflect 26.5% sequential growth over Q1 2017. Current sales pace exceeds $1.5 million per month. The Company continues to execute well on all aspects of its growth strategy through the construction of a state-of-the-art 800,000 square foot production facility, as well as continued investments in technology, innovation, partnerships, customer service, and sales and marketing. Achieved a seven-day sales record between February 2 and 8, 2017, with more than 68 kilograms sold over that period. Received Health Canada license to sell cannabis oils, enabling Aurora to participate in this rapidly growing, higher margin segment of the medical cannabis market. Announced a bought deal private placement financing of $60 million with an over-allotment option to increase the offering to up to $75 million. Construction of the 800,000 square foot Aurora Sky facility continues to progress well and on schedule, with completion anticipated for the second half of 2017.Contracts have been awarded for the general contractor, and engineering and architectural suppliers. Cut and fill has been completed on the first 500,000 square feet, while screw piles have been sunk for the first 300,000 square feet. Raised $5.5 million from the exercise of warrants, options and compensation options. Approximately $23 million in additional gross cash proceeds potentially available from the exercise of warrants, stock options and compensation options/warrants. On January 16, 2017, the Company initiated a voluntary recall of products purchased from another licensed producer for resale purposes, which the Company had found to contain a pesticide not currently registered for use on medical cannabis. A credit in the amount of approximately $450,000, fully covering Aurora’s costs incurred via extension of purchase credits by Aurora to its affected clients. Signed a Memorandum of Understanding with Radient Technologies Inc. (“Radient”) for the joint development and commercialization of superior and standardized cannabinoid extracts at high throughputs. Invested in Radient by way of a $2,000,000 10% convertible debenture. Additionally, announced the intention to participate in Radient’s private placement financing of up to $1,250,000 units at $0.45 per unit. The Aurora team continues to exceed its very aggressive strategic goals set out and approved by its board of directors. Commenced construction on Aurora Sky, an 800,000 square foot state-of-the-art hybrid greenhouse facility anticipated to produce, at full capacity, approximately 100,000 kg of cannabis per year. The new facility is located at the Edmonton International Airport, providing important strategic advantages, such as logistics, customs, bonded warehousing and industrial infrastructure. Management believes the new facility will contribute to significant savings in production costs on a per gram basis. Sales pace for the quarter in excess of $1.2 million per month. Generated approximately $16.9 million in additional gross cash proceeds from exercise of warrants, stock options and compensation options. $25 million in completed brokered private placement of 8% unsecured convertible debentures. Since launch of the app, patient ordering by phone has been reduced by 50%. Further strengthened board governance with the appointment of Michael Singer as Chairman of the board and the appointment of Joseph Del Moral and Barry Fishman as members of the board. Appointed Cam Battley as Executive Vice President. A comprehensive discussion of Aurora’s financials and operations are provided in the Company’s Management Discussion & Analysis and Financial Statements filed with SEDAR and can be found on www.sedar.com. The Company sold 538,045 grams of cannabis during the period under review, up 23.5% from Q1 2017. Revenues of $3.9 million were generated, as compared to $nil for the same period in the prior year, and up 26%, or approximately $0.8 million, from Q1 2017, reflecting an increase in the average price per gram of product sold. Aurora commenced selling medical cannabis products on January 5, 2016. Revenues generated to date reflect what management believes is the fastest growth rate of active registered patients in the industry as the Company scales up to full production capacity at its existing facility in Mountain View County, Alberta. Gross margin was $4.4 million for the three months ended December 31, 2016. During the prior period, the Company did not generate any revenue from operations as the Company had not commenced sales of medical cannabis. However, the Company had been building up its inventory and recorded a gain on the changes in fair value of its biological assets of $2.2 million. General and administration costs increased by $0.8 million for the three months ended December 31, 2016. The overall increase was largely attributable to legal fees in relation to financing activities and due diligence conducted during the quarter, as well as the completion of the acquisition of CanvasRx. Sales and marketing expenses for Q2 2017 increased by $2.1 million compared to the same period in the prior year, due primarily to the Company commencing its commercial operations and sales of medical cannabis January 2016 and generated expense related to the roll-out of its commercial initiatives. The Company recorded a net loss of $2.7 million for the quarter, as compared to a $0.6 million net profit for the same period in the prior year and a $2.9 million improvement from a $5.6 million loss for Q1 2017. The net loss includes non-cash share based payments totaling $2.5 million. The net profit for the prior year’s second quarter was attributable mainly to a $2.2 million unrealized gain on changes in fair value of biological assets. As compared to the prior year, the net loss recorded for the period under review was due predominantly to a $5.2 million (including share-based payments) increase in operational expenses, including aforementioned share-based payments. Working capital as of December 31, 2016 was $60.1 million, as compared to a deficiency of $2.7 million as at June 30, 2016. The $62.8 million increase in working capital was attributable primarily to an increase in cash and cash equivalents of $55.6 million, offset partially by a decrease in short term loans of $4.4 million. The increase in cash and cash equivalents resulted mainly from net cash generated from financings of $69.9 million, offset partially by net cash used for operations of $6.0 million, as well as cash used for investments of $8.3 million. Subsequent to December 31, 2016, the Company announced a brokered private placement for up to $75 million, as well as raised $5.5 million from the exercise of warrants, stock options and compensation options/warrants. 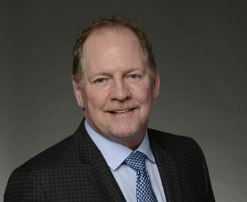 Aurora’s business strategy is to continue accelerating its penetration of the Canadian cannabis market, leverage its Health Canada sales license for derivative products (cannabis oils) and launch cannabis oils sales, transition to profitability in the short-term, and complete a major facility expansion for additional production capacity. When the federal government passes legislation legalizing the consumer use of cannabis, the Company anticipates participating in the non-medical consumer market, and will envision further production capacity expansion to meet future market demand for cannabis products. Aurora’s wholly-owned subsidiary, Aurora Cannabis Enterprises Inc., is a licensed producer of medical cannabis pursuant to Health Canada’s Access to Cannabis for Medical Purposes Regulations (ACMPR). The Company operates a 55,200 square foot, state-of-the-art production facility in Mountain View County, Alberta, and is currently constructing a second 800,000 square foot, highly automated production facility at the Edmonton International Airport. Aurora trades on the TSX Venture Exchange under the symbol “ACB”.